In a quick hearing, former North Dakota Governor Ed Schafer was unanimously confirmed Secretary of Agriculture by the US Senate. Today, he was confirmed by unanimous consent in the Senate after members of North Dakota's congressional delegation asked Senate Majority Leader Harry Reid to expedite his case so the former governor could be a part of the President's cabinet for tonight's State of the Union address. (Sen. Kent Conrad, -D- ND) "The White House continues to maintain the President will veto this legislation which I think would be a mistake, a mistake for the economy and certainly a mistake for North Dakota." (Sen. Byron Dorgan, -D- ND) "Family farmers are wondering what's this farm program going to be? And we're getting near spring planting so we need to get this done. 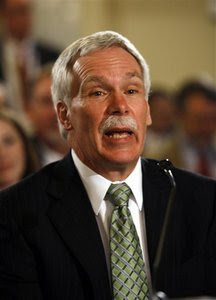 The action today by unanimous consent to put Governor Schafer in that secretary chair is I think a big step forward." Sen. John Thune, R-S.D., applauded Shafer’s speedy Senate confirmation. “I was encouraged by Governor Shafer’s remarks at last week’s Senate Agriculture Committee confirmation hearing that he was prepared to work with the Senate and House Agriculture Committees on behalf of the administration to have a farm bill in place by March 15, when the 2002 Farm Bill extension expires,” Thune said. Sen. Tim Johnson, D-S.D., issued a statement congratulating Shafer on his confirmation. “The secretary is from our nation’s heartland, and he will surely have his hands full as America’s farmers and ranchers look to him to be a strong voice at the USDA,” Johnson said in the statement.